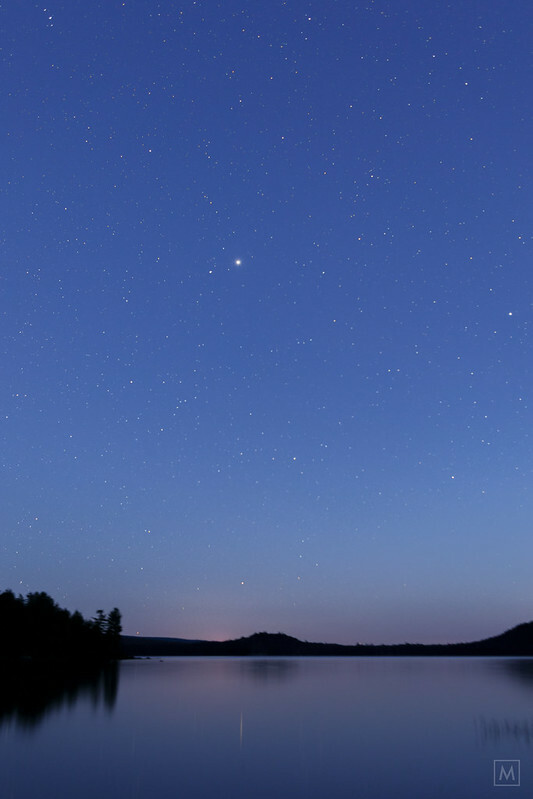 Wonderful overnight at Lake Lila to watch the stars. I had some client work in Saranac / Lake Placid / Tupper on Friday, so I planned to spend some time at Lila. 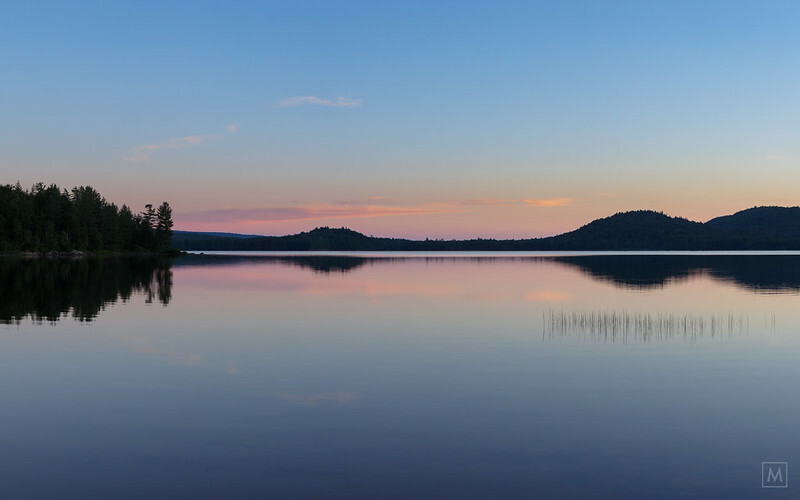 I was traveling lite, no canoe, no camping gear - just some snacks, camera gear, too few layers, camp chair and my summer weight sleeping bag. I walked in around 6pm, looking for a spot on the northern shore to setup for an evening of star gazing. 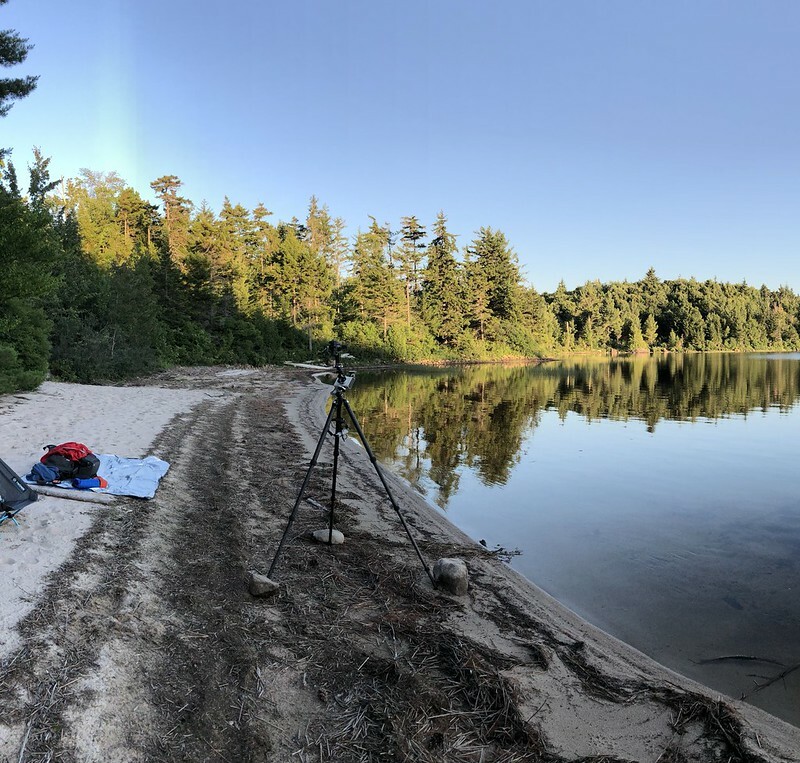 I scouted a few spots, hoping to find campsite 5 from the road, and ended up at the western edge of the lake. I found a great beach, but as I climbed out of the woods there were some folks setting up having arrived by canoe a few minutes before me. I backtracked on the road and eventually got a glimpse of lovely beach through the trees and bushwhacked to the water, stumbling right into 5. 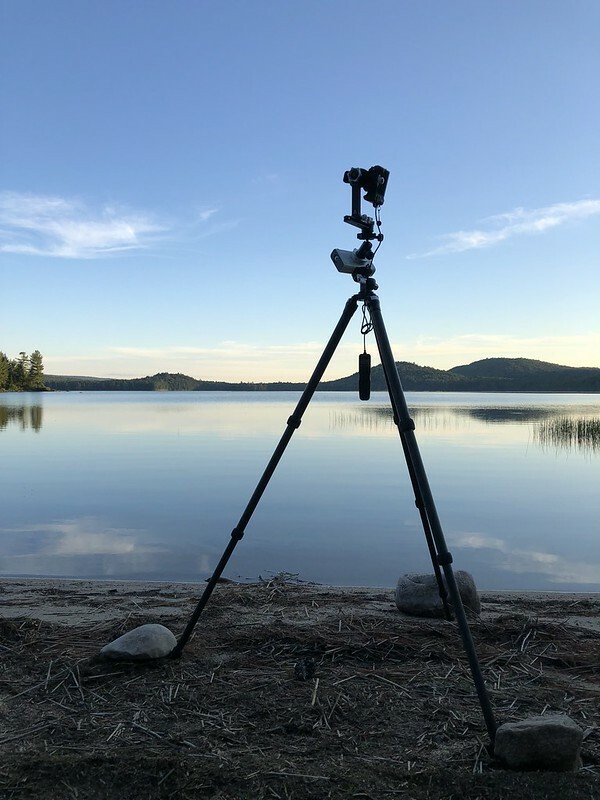 I staked out the site and beach, and then setup my camera, chair and tarp. Snacks, and then the waiting game began. The bugs were intense. I wrapped myself in my summer bag and all the layers I had. It sounded like there were hundreds of people in the woods running window fans. Eventually it cooled enough that the bugs subsided, the bats stopped flitting about, and I was left with the sky, quiet, and a bit cold. 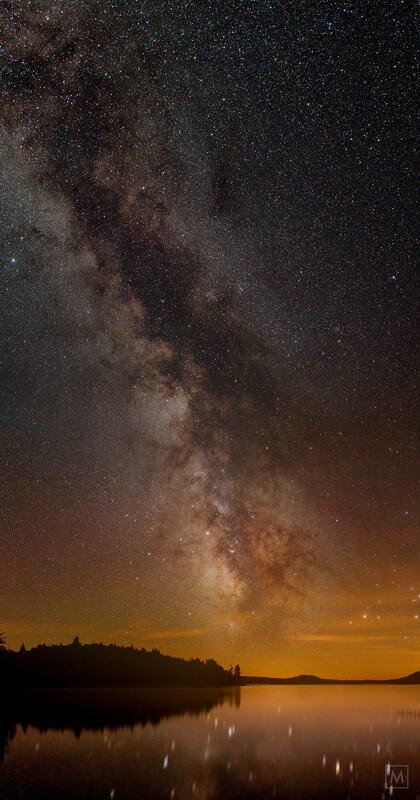 I have another set of sky images that I'm processing of the Milky Way. Lots of learning... I packed up at about 2:30, walked back to the car, took a nap in the hatchback, and made it back to Vermont for breakfast. A good couple of days. Beautiful pictures! Thanks for posting. 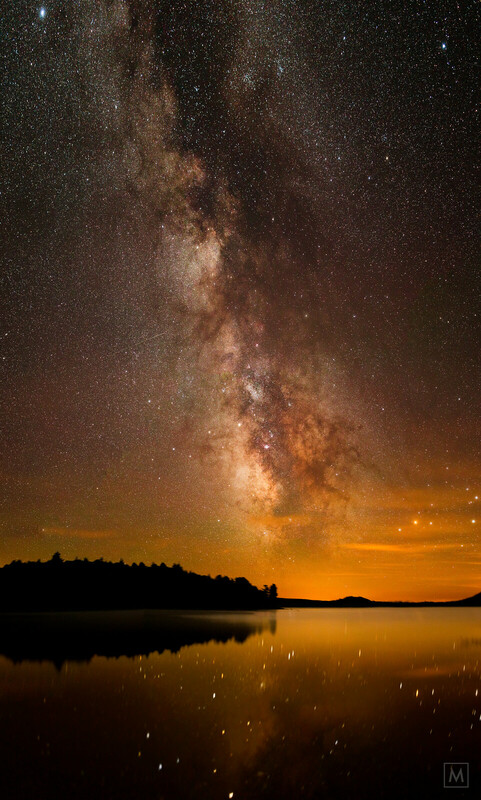 That Milky Way shot is incredible...I always try for something like that but never come close. Wanna share what ISO, lens opening and shutter speed? That one is with a manual Rokinon 12mm lens, likely f/2 (no electronics in the lens to pass data to camera) ISO 1600 15s exposure. Depending on your camera and lens you will get star trailing pretty quickly, so exposures need to be short. But, the Lila shots are more complicated. My camera (little canon mirror less) was riding on a little tracker that rotates the same speed as the stars. You align it to Polaris and if you get it right you can do a 1-2-3-4 minute exposure without trailing. For this shot (just processed tonight - using a 22mm lens I made 2) 2 minute exposures f2.8 ISO 800 for 12 different camera positions (to make a mosaic, or panorama). Once home I stacked the 2 on top of each other in a program that uses an algorithm to knock out the noise. Then I had 12 images (4 overlapping rows, 3 overlapping columns) - I used panorama software to stitch the combined images together. Once stitched I processed in Photoshop and Lightroom. Last edited by bmike-vt; 07-11-2018 at 04:05 PM.. Thank you everyone! Been a learning journey for me. and no satellite or airplane trails! Nice. There were a few... but in the previous image I stacked them to remove noise - so when the software compares pixels - if the 2 images don't match it sometimes tossed plane / satellite data. 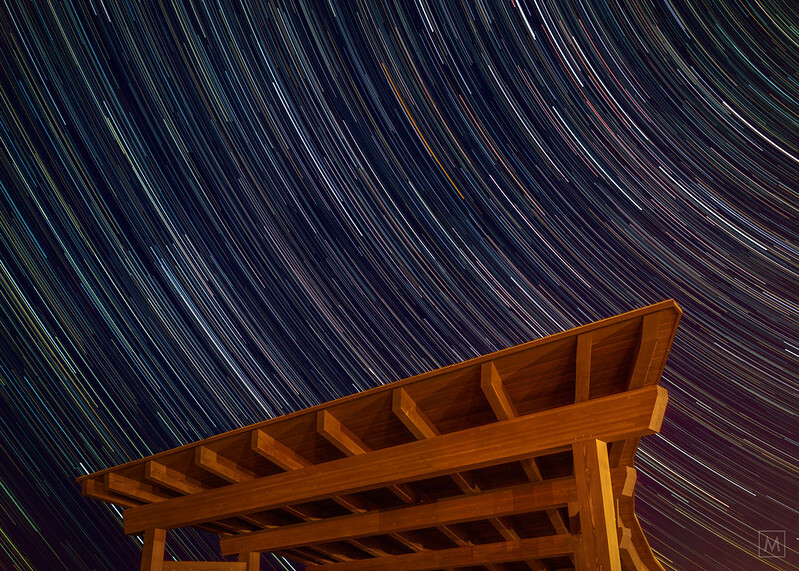 On the timber frame / star trails shot I masked them out. Here is an updated, reprocessed shot. 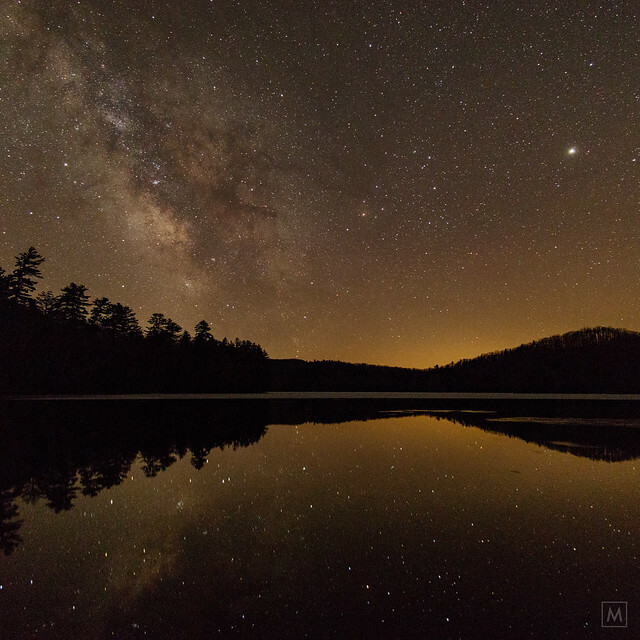 This is 12 images stitched in panorama software to create the MW. bmike: Tupper Lake has an observatory that is open to the public. Have you been there? The roof of the facility slides away at night so the telescope can do its thing. I've never been to it but am wondering if it might be of interest to you and your photography. Its located just past the Little Wolf campsites. Not sure what their schedule is like. Here's a link. 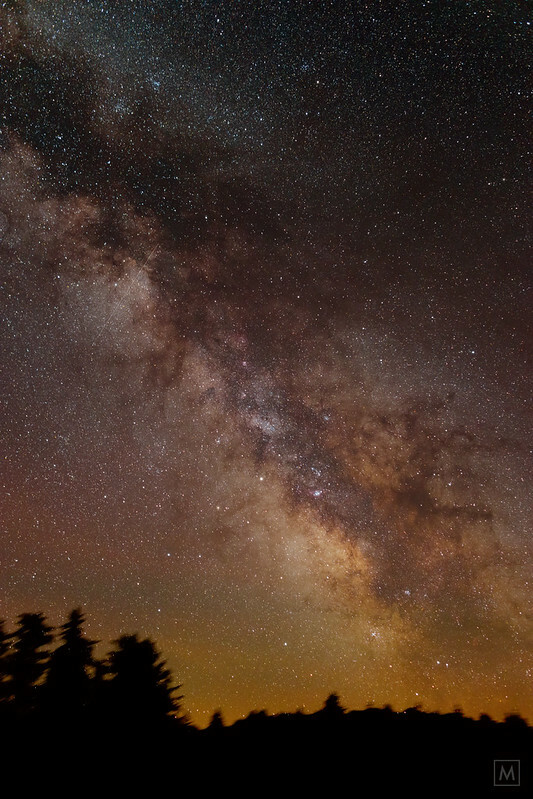 And they have an astrophotography conference this October... if we are still stateside I may try to attend. I was impressed with how dark the sky was, even right in town @ the park shooting the timber frame.